March 9, 2018: WFMU Marathon Show #1 with Matt Warwick!!! 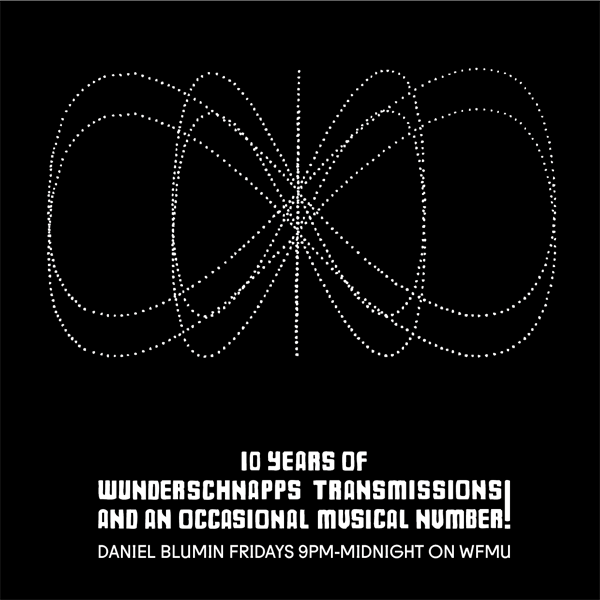 Daniel Blumin's 10th Anniversary Wunderschnapps Transmissions T-Shirt designed by Alex Jako! Evenin' D.J. D.B. // Mancunian sonic transmission night along Hudson waves. Hallo, all! Pledge to your hearts' content! Keep WFMU on the airwaves!!! Heat the lava lamp. // Really, early Floyd, far out man. Don't let the lava lamps melt the beanbags. Good evening, Daniel, Li'l Matty W and quad-hyper-cycloids. That tune- now 40 yrs ago! for a hundred bucks, open an old wound! We're on the edge of our water beds, by the bong. I think everybody has been to a venue like that. The first time I saw Sonic Boom, there were 8 people in the audience in a club that holds 250 (it wasn't promoted). After the show, he gave a everyone a tour of his analogue synths, and smoked us out. He recognized me at shows for the next 15 years (and smoked out one other time). do more people listen on the stream now than the radio? Heck, In Brooklyn, I listened to the stream most of the time, as the signal much of the time could be dodgy. Now in FL, I have no choice. Ah yeah...places like that. Oh the places I have seen. Most Woofmoos ear it via interwebs. Me, now via radio. One of the reasons I started listening to WFMU was the fact that my stereo wasn't picking up any radio stations. 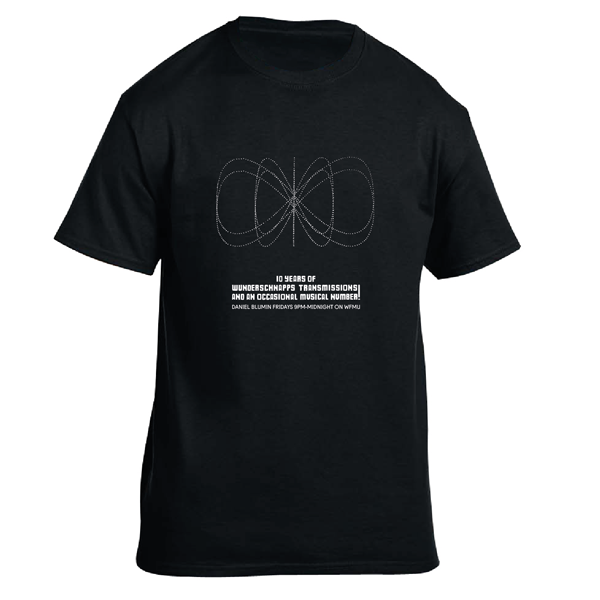 Any pledge of 75 dollars or above gets you the Wunderschnapps Transmissions t-shirt!!! All hail, fleep, Ryan, TDK, ultra, Uncle M, Ken, Andrew, ngh, and you! By the time the signal improved in Brooklyn, I still listened via the web, as by then, my only radios were 40-year-old boomboxes and 30-year-old walkmen (and my other self powered radios). now that there is an AAC stream, things are really on the uptick for as streamers. Henson just rhymed 'understand" with "understand." It looks like I'm going full mouse for S4L, and have yet to pick any swag. Cleaning, will be in and out. Pay day has arrived! I could finally pledge. Thank you WFMU for so much great music and entertainment! Daniel Blumin and Matt Warwick together... Matt on a Friday night! Heaven! We like those surf instrumentals, the fast dances, slow dances, the singalongs, and the smash hits too. @TWM, yes, my understanding is that slightly more now stream than listen over air. >broadcast note> both 91.1 & 91.9 just stopped. is there ice in NYC metro? Yep, no fm here in lower Manhattan. And @TDK60, I've a tdk 120 ready for tomw's YLTengo. (I normally use 90s but too lazy to look for them. ). Yay, fm is back. Hello Daniel and Matty and listeners! >brdcst note> both back: 91.9 stronger than 91.1. Sorry interwebsians, it's a radio thang. That was an epic B-in this afternoon, I must say. you two are hilarious together. I love marathon! Any chance Matt of you showing Daniel how to use the Echo Machine? Designed by next up DJ Rich Hazelton! Matt W on a script? Is this the mirror universe? Does Matt have a goatee? I also just listened to Sheila B with Daniel as cohost, his show must be a reverse Bluminatrix. Oh my! Check-out the Dirty Songs line-up: David Toop, Evan Parker, Mark Sanders, Phil Minton, Steve Beresford!!! Matt is a bearded fellow! But no goateee!!! Looms, the CD is a gem!!! Hi Daniel! Nice to meet you earlier. remember when every alternative band had to have at least three goateed members? Felder break in fifteen minutes! @Daniel Not to be a Star Trek geek but Matt W might be the same as Lorca, evil universe pretending to be normal. Little tidbit: Todd Rungren is a Philly native. However, he did record a bunch of material at Bearsville Studio. I've got so many WFMU shirts that people i see on a regular basis ask me if i work for you (after asking me what the hell WFMU is). Never sure how to answer either of those questions. I cannot wait to model my Wunderschnapps. Hey I am out at a bar seeing some live music but wanted to say hi. You’re in my top 3 favorite shows. I know you’ve been there all day. Looking forward to the shirt. Do you need a radio nurse, DJ Daniel? Poptones was amazing live this year. Saw them with about 30 other people. Time to go to sleep, thanks to both of you for this hilarious show! Peoples, pledge at 800-989-9368! wfmu.org is swell as well! We have just over 1000 bux to go!!! If i win the 2lp set, please give it to another person. Can’t play vinyl. Cheers! daniel: i met you in the record library when i was replacing floor tiles there last month. i’m embarassed to admit that this is the first time i’m catching yer show. you guys are cracking g me up! Massive thank yous to all for pledging to support the show and WFMU, and a wunderschnapps thank you to Matt Warwick for co-hosting and aiding and abetting! All hail the volunteer massive for the marathon help! Keep pledging to keep WFMU crankin' all year long! See ya Week II w/ Stashu!! !